GTA 6 probably isn’t coming out anytime soon. 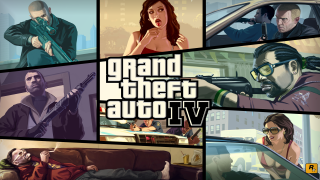 But if you have an itch you need to scratch for crime, cash and bowling, you’ll be pleased to know that Grand Theft Auto IV is now available on Xbox One thanks to the system’s backwards compatibility feature, as is the game’s ultra-popular DLC add-on, Grand Theft Auto: Liberty City Stories. Now, you might be tempted to go in and run through the game’s excellently crafted story that takes an immigrant from the bottom social strata to the top of the world in true Scarface style, but don’t forget about your cousin. He called us and he wants to go bowling. The game is available on Xbox One in two ways – either by inserting the Xbox 360 disc into the Xbox One, or downloading the digital version of the game from the Xbox Store. Don’t want to lose your progress in the story? Just move your saved game file on the Xbox 360 to the cloud saves folder and you’ll be able to pick up exactly where you left off on the Xbox One. Finally, if you can’t find your original disc Grand Theft Auto IV is available to purchase for $19.99 through the Xbox Store. Don’t forget to call your cousin for bowling. He misses you.